of the Flash, You Were Far Enough from Ground Zero." 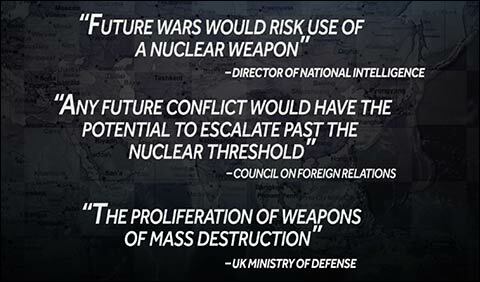 Two Nations With a Combined 230 Nuclear Warheads Under Their Control… May Be On the Brink of War. They've positioned 650,000 troops along the border that separates them. The following warnings have begun to appear in newspapers concerning a potentially imminent nuclear war. "People should construct basements where the whole family can stay for a fortnight." "In case no basement is available, people should construct bunkers." "If the blast wave does not arrive within five seconds of the flash, you were far enough from ground zero." "Vision should return in a few seconds." Tensions between the two hostile countries you're going to be briefed on have already led to the eruption of three major wars since 1947. And for years, our National Intelligence Community has feared a single and specific trigger event could ignite the fourth war. And many other world governments. That's what our National Intelligence Community and these global groups are willing to say publicly. But it's what they are not telling you – that you need to know. And the rival Prime Minister isn't backing down. He has ordered a military drill, involving the test launch of a new type of intercontinental, ballistic missile. It was armed with nuclear weapon capabilities. All it Takes is One Warhead to Unleash Global Bedlam. At Least 8 Radical, Islamic Factions, Including Al-Qaeda and the Taliban… Are Dangerously Close to These Nuclear Warheads. This is a holy war for them. And many fear a worst-case scenario is at our doorstep. In fact, the U.S. House of Representatives' Committee on Foreign Affairs recently held sensitive hearings where they warned this situation has taken us into a "Zero Sum world" of "political upheaval," "terrorism," and "war." It's been nearly seven decades since two nuclear bombs were detonated during World War II. Kent, thank you for being here. You are an official advisor to 27 world governments, including the United States, China, and Russia. You're a member of two U.S. State Department Task Forces. You're a regular contributor to Fox Business, Bloomberg… every major media outlet. Including, 6 of the 10 largest companies in the world. 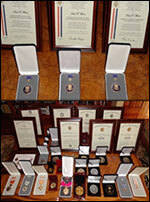 Three Distinguished Service Medals from Presidents Nixon, Reagan, and Clinton. Plus, 14 commendations from the National Intelligence Community. There are few people on this planet who are more qualified to explain this Zero Line Crisis than you. Mike, we have nine nations that currently possess an estimated 17,300 nuclear warheads. I've spent eight years of my career on the front lines assessing this growing threat. But what's developing between these two nations now has forced many world governments I advise – and their militaries and intelligence agencies – to prepare for the worst-case scenario. 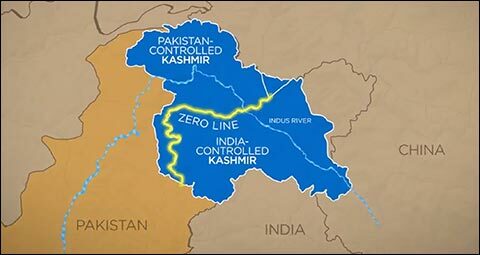 The Zero Line is the border that runs between India and Pakistan in an area called Kashmir. It is also known as "The Line of Control." But, in reality, there is no control of the Zero Line. Because both India and Pakistan claim Kashmir as theirs. To an 85,000 square mile territory. And running right through this disputed area – is this border – the Zero Line. Today, Pakistan has a strict first-use policy regarding nuclear war with India. It's centered around a very specific event that is escalating over the Zero Line right now. As in – this very moment. Making matters worse – we've got a major wildcard in play too. We all remember the term M.A.D. from the Cold War – or mutually assured destruction. This threat kept the United States and the USSR from firing nuclear weapons at each other. In the early 80s, I was working with the Reagan Administration to develop strategies for addressing the Soviet threat. So I had a front row seat for the threat of M.A.D. On Pakistan's Side, Mutually Assured Destruction May Not Be in Play. We're looking at at least eight radical, Islamic groups – including Al-Qaeda and the Taliban – with dangerous influence over the Pakistani military. Osama Bin Laden was shielded for years from the U.S. – not far from Islamabad. He was holed up next to the Pakistani equivalent of our West Point. He was also the Director General of Inter-Services Intelligence… Pakistan's chief spy agency. Years back, he led a dangerous military insurgency across the Zero Line. And today, the extreme groups tied to the Pakistani military view this as a Holy War. So much so, they've all teamed up – they've formed a coalition called the United Jihad Council. This has become a Jihad situation between Pakistan and India. That means all bets are off. What you call the Great Game. What we have Mike, is a classic case of history repeating itself. The original Great Game refers to this period in the late 1700s to early 1900s. These superpowers turned much of the world into a big chessboard. The Great Game ended with two World Wars, and from it, a new superpower rose up… the United States. For decades we controlled essentially the entire chessboard. But now we have competition – China. And we have a lot of dangerous, secondary international players. With 230 nuclear warheads in play, yes. Americans can't afford to stay in the dark about this. At the State Department, we believe winning this Great Game is critical to our entire foreign policy, our national security, and global stability. And there is $20 trillion a year in play. From a geopolitical standpoint you're talking about a re-shuffling of the food chain from the top Superpowers right down to the bottom. But for average Americans – it's a similar story. Folks caught off guard by how this Great Game is going to evolve stand to lose – on the low end – $1.41 trillion every year from Wall Street alone. And billions more could be eradicated from their bank accounts due to spikes in energy and natural resource prices, mixed with sudden drops in our dollar. Well, there is $20 trillion a year for the taking. As you can see, we're going to be discussing very serious issues that will have a direct impact on your life. Which is why after today's presentation, you can receive a free copy of Dr. Kent Moors' book: The Great Game: The Coming Face-Off For Global Supremacy. It will give you a true insider's view into these shocking events that are developing around the world. And it will map out a clear path for protecting your wealth moving forward. Okay Kent, let's examine this Zero Line Crisis between India and Pakistan. The Zero Line is the Most Dangerous, Militarized Border on the Planet. It's 460 miles long, 340 of which are covered by a double row of 12-foot high, electrified barbwire fencing. Now, where the fencing stops, row after row of landmines begin. There are thousands of them. And, on both sides of the Zero Line, the Indian and Pakistani armies have deployed an estimated 650,000 troops. And tens of thousands of police and paramilitary forces. In the Himalayan Mountains, snipers are camped out in camouflage posts and rock crevices. They've even taken this conflict 20,000 feet above the Zero Line in the Siachen Glacier. 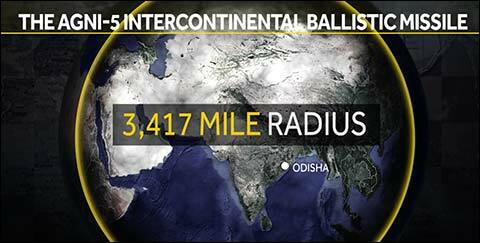 It's nicknamed "the highest battleground on earth." There are 150 manned posts and 6,000 troops just on this glacier. And this Zero Line Crisis has been a powder keg ready to explode for decades. There Have Been Three Wars Fought Between India and Pakistan Since 1947. And Two of Them Were Waged Over Who Controls the Zero Line. "The most dangerous place in the world right now, I think you could argue, is the Indian sub-continent, and the line of control in Kashmir." President Clinton nailed his assessment then… But it's even more dangerous now. I can tell you – on a near daily basis, the already fragile cease-fire between India and Pakistan is violated, as automatic and small-arms fire, RPGs, rockets and mortars are exchanged. Over 47,000 people have already lost their lives during this current, so-called "cease fire." And many worry this Zero Line has now become "ground zero" for a nuclear war? Because they appeared in the Greater Kashmir Newspaper. Right in the heart of the Zero Line. It Could Soon Get a lot Worse. A while back, a high-ranking Lieutenant General for the Pakistani military admitted that his country's entire nuclear weapons arsenal is aimed solely at India. Given their history – that's not an unexpected admission. But recently, Pakistan's Prime Minister – Nawaz Sharif – warned that Kashmir, home to this Zero Line, has become a flashpoint that can trigger a fourth war between Pakistan and India, basically, at any moment. Now Here's Why Washington, D.C. Has Deemed Ending This Zero Line Crisis… a Top Priority. Posturing can always escalate into action. And when it comes to a nuclear war with India, the Pakistani government has mandated a trigger happy, first-use policy. It's pretty easy to figure out what a first-use policy means. Yes, but the trigger event – that's the important part. Because in Pakistan's eyes, it's been "triggered." And not just theirs. 20 separate UN panels have already come to the same conclusion. And unfortunately, India's official counter-terrorism expert fears nuclear war is now a "when," not "whether" situation. 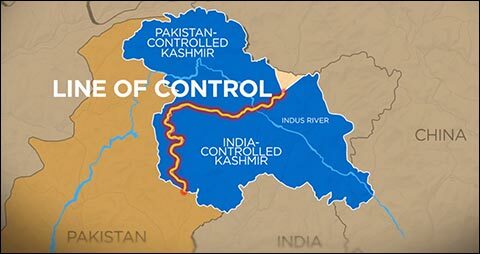 Pakistan Can Initiate its First-Use Policy… They Can Pre-Emptively Start a Nuclear War With India at Any Moment… Over One River. How could one river could cause such a dangerous situation? It's a lethal cocktail of geography and geopolitics. 90% of its freshwater for agriculture. 50% of the country's employment. And 25% of its GDP. They call the Indus River "the water of life." You see, the Indus River begins in India before crossing over the Zero Line and into Pakistan. Well, in 1960, Pakistan and India sat down to negotiate a tense agreement called the Indus Waters Treaty. It gave complete control of the Indus River and two of its tributaries to Pakistan. One it appears nobody in Pakistan caught. In 1960, When Pakistan Signed the Indus Waters Treaty, They Had a Population of 45 Million People. Today, They Have 178 Million. When India Signed That Treaty, They Had a Population of 448 Million People. Today, They Have 1.2 Billion. More people equals more electricity. Since 1980, India's electricity demands have shot up over 613%. And folks there have seen their electricity prices spike 500%. India has to double their energy production capabilities within the next few years just to satisfy their growing population. But already, sudden power outages are pushing 700 million into the dark without any warning. Which is leading to fears of violent riots erupting. So that means they're faced with few choices. And the choice they initially made was a dangerous one. India's plan was to use the Indus River to boost their hydropower capabilities by 4,000%. So they are essentially damning off much of the flow of the Indus River before it even crosses the Zero Line. At any given time, India only has enough water to satisfy its nation's needs for 120 days. The groundwater supplies for Delhi, Mumbai, Hyderabad, and Chennai are declining so fast, it's estimated they'll be gone in a few years. They haven't left themselves much of a safety net. So India is also tapping into the Indus River for irrigation. This has created a line-in-the-sand moment. Because Pakistan is already dry to the bone. They have enough water reserves for only 30 days – at any given time – in that country. This situation has grown so severe, in the slums of Karachi, stealing water from public pipes has become a $500 million a year business. They're literally selling this black market water out of the back of trucks. Karachi is located at the very end of the Indus River – just to the west. This situation is impacting water supplies many miles away from Kashmir – from the Zero Line. And we're quickly reaching a boiling point. In 2008, we all witnessed a horrific attack in Mumbai, India that was carried out by Pakistani extremists. 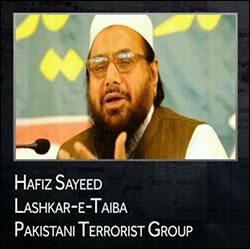 One of the alleged ringleaders, Hafiz Sayeed, justified this atrocity by accusing India of committing "water terrorism" against Pakistan. As startling as that incident was, its radius of destruction was limited. But they have the means to create unlimited destruction. The U.S. Intelligence Community now warns competition for water could lead to state failure in countries that are geopolitically important to us. The folks I work with here have identified 15 countries most at risk of state failure. 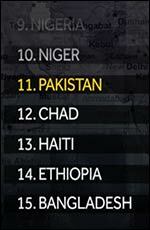 Pakistan is now at risk of state failure. Because one river is essential to 90% of Pakistan's water needs and 50% of its employment. The Pakistani government's official policy is that they can pre-emptively start a nuclear war because of this river. This same river is also why 178 million Pakistanis now face life-threatening water shortages. And they've all formed one united front – a United Jihad Council. They've declared a holy war. And this equals one thing according to the National Intelligence Community. Their next war – their 4th war – could be nuclear. "Increased tensions in Kashmir" – aka the Zero Line – that were brought on by "water crises." The Council on Foreign Relations – same conclusion. Hostilities between India and Pakistan could escalate past the nuclear threshold. It could happen over "access to water." "The Proliferation of Weapons of Mass Destruction." Because of "conflicts over water." Specifically "access to water between India and Pakistan." Look at this Zero Line Crisis as one event in this global Great Game. For India and Pakistan – water is the queen piece on this chessboard – for both sides. And both their queens have fallen. Yes, so that leaves them at a stalemate. Neither side wants to start a nuclear war… or be seen as the weak side. But neither side has a move on this chessboard – without having to make a major sacrifice. But India recently made a move that could certainly be deemed a "major sacrifice." The Agni-5 intercontinental ballistic missile. They launched it from Odisha, in Eastern India. It was a very dangerous gamble. The Agni-5 has a range of 3,417 miles. Important interests to the United States. This was a wake-up call to the entire world. It wouldn't create a regional conflict like we've seen in Syria or Libya. These are terrible situations, but they would pale in comparison to this. This could create World War III. 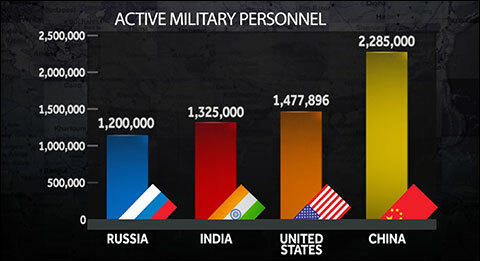 India has one of the most powerful and largest militaries on the planet. Pakistan would become unhinged – forget rational diplomacy. We'd now be dealing with those radical Islamic elements face-to-face. These two nuclear powers would drag every major nation into this. And sides would be taken. The loss of human life would be almost impossible to imagine. The economic impact would be devastating. When World War I broke out, our stock market fell 33%. World War II, it fell about 30%. If we were to see those kinds of losses today – you're looking at between $7.2 and $8 trillion in American wealth gone. Would it return? Does anybody want to take the chance? At its core – this situation – isn't about a nuclear war. No, it's a story about a resource war. Water and energy in Pakistan and India. The tensions between India and Pakistan are just one example of a long line that are in play now. And the outcome will determine who truly controls the balance of power in the future. 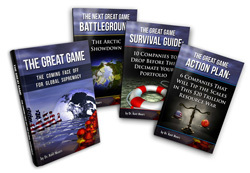 In a few minutes, after this presentation is over, we're going to send free copies of The Great Game: The Coming Face-Off For Global Supremacy to folks who want to get this intelligence in their hands. You're what's called a "facilitator." Or when negotiations between say – a private sector entity – and a volatile country become tense. I'm brought in to identify the problem and the solution. So, yes I'm facilitating solutions that way. So explain the aggressive actions the United States has been taking to solve this Zero Line Crisis? I can say with firsthand knowledge that a lot of money is being allocated through backchannels by our government to solving it. And billions to India as well. So we've tried the diplomatic route. We have a strong naval presence in the Arabian Sea – we have tens of thousands of troops stationed in the region. Our special forces have been on the ground. So we've tried peaceful, yet serious military tactics. We've tried the conventional routes. Yes, now we're taking a new approach – a private sector solution. It's coming from a defense contractor I know quite well. I believe it can stop this Zero Line Crisis from escalating into a nuclear war. And that's something we should all get behind. Kent, we've talked a lot about your many roles in the private and public sector, but here at Money Morning, you are our Director of Geopolitical & Resource Investing. The role of "facilitator" you play in your dealings with governments and international agencies and companies – you apply that knowledge to the markets. It's an unfortunate reality – war is a profitable business. 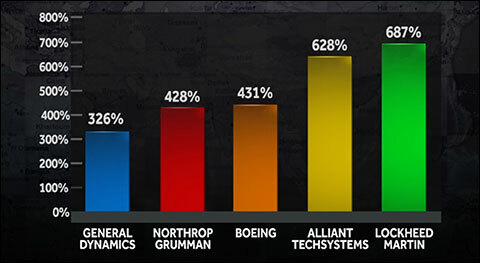 And the defense sector has been especially profitable in recent years. General Dynamics – with tanks. Northrop Grumman – the stealth bomber. Boeing – the Apache helicopter. Alliant Techsystems – machine gun ammunition. Lockheed Martin – Tomahawk missiles. These guys have made a lot of money on war through the conventional channels. But the dynamics are now changing. And into Solving Problems Before They Lead to Conflict. And one under-the-radar player in the defense sector has the solution to this Zero Line Crisis and many future conflicts. 99% of all water on this planet is saltwater. And India has 4,671 miles of coastline to tap into that saltwater. A new approach to desalination is the key to solving this Zero Line Crisis. Now, the "old fashioned," desalination technology is five times more expensive at converting saltwater to freshwater than just extracting it from groundwater, lakes, and rivers. Because it relies on thick filters to separate the salt from the water. A stack of paper – three reams worth – measures about six inches high. This is the thickness of the current desalination filters. Now, remove just one of these sheets. This represents the width of the desalination filter this defense contractor has developed. And it uses 1/100th – that's 1% – of the energy it previously took. Desalination now becomes economically viable in even the poorest countries. It becomes economically viable to the 780 million people who can't access clean drinking water now. Kent, talk about this filter's secret. It's built with a "miracle material" called graphene. At 1-atom thick, graphene is the thinnest material on the planet. It's more flexible than rubber. Yet, it's stronger than diamonds – 300 times stronger than steel. Mike, graphene is so strong it can literally remove radioactive elements from water that's been contaminated from a nuclear spill. You could drink that water right after it runs through this filter. And it's not a rare material. No, it's an advanced material – extracted from graphite – with massive potential for numerous applications. This defense contractor was one of the early innovators with graphene. I was sent their internal memo that reveals this desalination breakthrough. Originally they had been working with graphene in what they called their "core markets, including aircraft and spacecraft." "Revolutionize the process of desalination by making it far more efficient and less expensive." They combined the leaders of their "Mission Systems and Training, Advanced Technology Laboratories and Space Systems" departments. And this technology could stop the Zero Line Crisis from escalating into a "worst-case scenario?" Let me put it this way, Mike. Coincidentally, around the same time this technology was first presented, India committed to building 500 desalination plants by 2017. India is now allocating $92.1 billion a year – that's a year – towards solving this water crisis. They are being quietly directed to the company that controls this incredible filter. This company has already set up shop in India. They now have an office in New Delhi. And Pakistan has started to do their part as well? Pakistan has committed $300 billion towards water technology. They recently built 12 desalination plants. And a massive one is currently in the works in Karachi. It has already secured very large contracts with Pakistan as well. I'm not much for coincidences Mike. 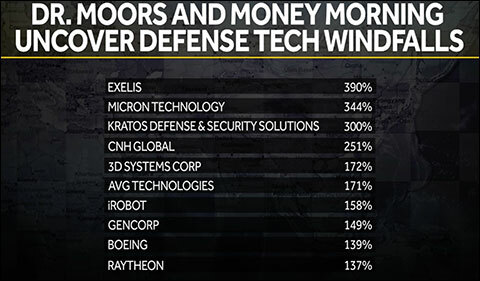 Kent, here at Money Morning, we've been helping people capitalize on military and defense technologies for years. What's the profit potential for this company – thanks to its graphene-based, desalination filter? Factoring in just the most conservative growth rates for this technology, it could propel this defense contractor's share price up 464%. But Mike, that's a conservative estimate. This contractor has big plans for taking what they've learned from this graphene breakthrough. That internal memo – they hint at this. They're going to apply a variation of this technology to "sensors in electronics platforms and other structural applications." That's going to be a $7 trillion a year global industry. They're also going to expand it into "biopharmaceutical" uses – another big deal. Early research suggests graphene, when used as a delivery mechanism, can create a 1,000-fold boost to the effectiveness of cancer drugs. They are also looking to use graphene to maximize output from "oil and gas wells." So really – 464% gains is a jumping off point. Folks can consider two or three times that in play as this develops. Plus, besides capital gains – you're looking at a company that has raised its dividend price aggressively, each year, for the last 11 years. But here's a really exciting glimpse into the future. Their dividend has risen 101% – it's more than doubled – since before they developed this desalination technology. Kent, your book is just one part of a free package you've put together called The Great Game Blueprint. You've also prepared a free companion piece – an investment intelligence briefing. 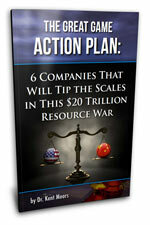 The Great Game Action Plan: 6 Companies That Will Tip the Scales in This $20 Trillion Resource War. 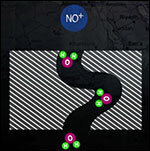 It reveals this defense contractor and explores its graphene-based desalination breakthrough. Mike, there are six companies nations are playing kingmaker with right now. Or the geopolitically sensitive deals these nations crave, to help them get a leg up in this $20 trillion a year resource war. I'm directly involved with many of them. These six companies could make Americans who get into them now a fortune. 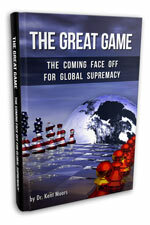 We're going to continue exploring some of the other pieces on this geopolitical chessboard – this Great Game. But you don't have to wait to claim a free copy of Dr. Kent Moors' Great Game Blueprint. This package is yours at no cost if you're one of the first 1,000 to step forward today. There is a button at the bottom of this page you can click at any time to secure it. Plus, The Great Game Action Plan, which reveals six lucrative investment opportunities. 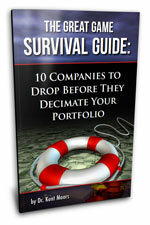 The Great Game Survival Guide: 10 Companies to Drop Before They Decimate Your Portfolio. Kent, before we dive back into our discussion, talk about this. Mike, the re-balancing of power between nations could cause certain currencies to be destroyed – economies to weaken, companies to crumble – this Great Game is going to cause volatility. Americans have to protect their financial security from all of this, before escalations begin to speed up. That's about two times the entire world's GDP. If they fall – they are going to take a lot of folks down with them. I estimate the losers of this Great Game will rob Americans of a bare minimum of $1.41 trillion from their portfolios every year for the foreseeable future. And that's a best-case scenario – that's if we don't see some of the extreme outcomes that are quite possible now. If we do – that $1.41 trillion will multiply. And this survival guide helps protect Americans from the losers, Mike. The 10 companies I warn about in this report, people need to know to get out of them – and get out of them now. As you can see folks, this Great Game Blueprint, with the book and the two intelligence briefings, is comprehensive. It will give you specific guidance for preparing your investments and personal finances for the future. And in a few minutes you will be sent a copy of it for free. Kent, we don't have a lot of time left – so let's cover as much as we can right now. There are only two superpowers in the world – the United States and China. We're both thinking 5-10 moves ahead on this chessboard. Everyone else is playing one move at a time. The House Committee on Foreign Affairs just held hearings on the Emerging Threat of Resource Wars. The military – intelligence community – all the major D.C. players took part in these hearings. And, one of the revelations was "Beijing is abandoning its 'peaceful rise' policy." For over two decades now – China has essentially used cheap labor to aggressively grow their economy. In 1993, their total GDP was $441 billion. It's grown 1,917%, or $8.4 trillion since then. But to maintain this growth going forward, they have to now get natural resources from all over the world. And if they have to use military force – they are not afraid to. Like what's happening between China, Japan, and the U.S. over the South Sea. China believes the South Sea contains 200 billion barrels of oil. Problem is – Japan says it's theirs. The Philippines, Vietnam, Malaysia, Brunei, and Taiwan also believe they have legitimate stakes to the energy out there. And due to our relationship with some of these nations – Japan and Taiwan specifically – the United States is directly involved in this conflict. Last year, we had an extremely close call when the USS Cowpens – a guided-missile cruiser – narrowly missed a sea battle with a Chinese warship. 2009 and 2001… similar situations. So we're going to continue to see some tensions here. 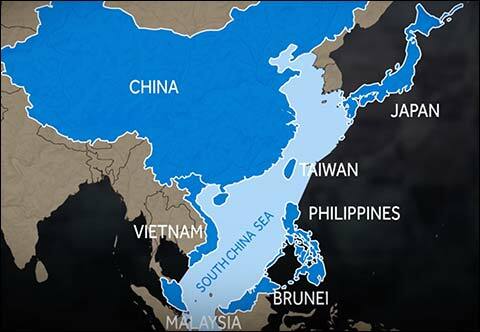 The U.S. Navy is planning to position 60% of their forces into the Asian seas by the end of this decade. Because, China has multiplied their military spending by over two and a half times since 2006. And it's not just Japan, the United States, and those other countries you mentioned that China is walking a tight rope with. China is Now Doing Business with a Mexican Drug Cartel. Yes, the Knights Templar Cartel. They are dealing iron ore to the Chinese government. 4 million tons of it. Taken straight from mines this cartel controls, this iron ore is moved in broad daylight on trucks directly to a major port in the city of Lazaro Cardenas. From there it is shipped out to China. No, however, this is about perspective, Mike. A lot of folks have seen the news reports of these ghost cities they're building over there. 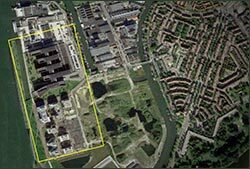 The Hennan Province Ghost City – it's the size of Chicago and Houston combined. 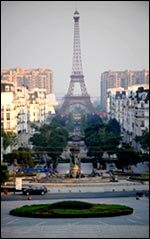 The Kangbashi District is nicknamed "the Dubai of China." China has built 64 million empty homes – the equivalent of 32 empty Washington D.C.s. They're building for tomorrow – not today. Just to maintain their growing empire, they need to secure at least $11.7 trillion in international, natural resource deals. So they're forming strategic alliances with anyone who has what they need. Even a drug cartel in Mexico. That iron ore is helping to fuel their construction boom. In some instances – like with the South Sea and Japan – they are abandoning that "peaceful rise" doctrine – they are willing to use military force to get what they want. But most of their deals – it's about strategic alliances and economic muscle. They're going into nations and essentially giving them bribes and bailouts. China takes 44% of Angola's exported oil. They gave them a $13 billion bailout to grease the wheels there. Nigeria is sending China 200,000 barrels of oil a day. They built Nigeria an airport to get that. In Russia – after China hands them a $55 billion economic bailout of cheap loans – Russia floods China with oil and gas in return. In Venezuela – China's receiving $4.02 billion worth of natural resources. In Iraq, China has secured a deal to develop the Rumalia oil field. That's one-third of Iraq's total oil output. China has formed strategic alliances with all of them. You got caught in the middle of a dicey situation on one of their recent strategic alliances in Ecuador. Yes, in Ecuador I oversee a $13 billion, 300,000 barrel-a-day oil project for the U.S. State Department. I work with Wilson Pastor specifically on this. He's the former President of OPEC and current Energy Minister for Ecuador. Ecuador had defaulted on a bunch of loans – they were dead in the water – nobody was going to loan them any money. So China wrote them some big bailout checks. 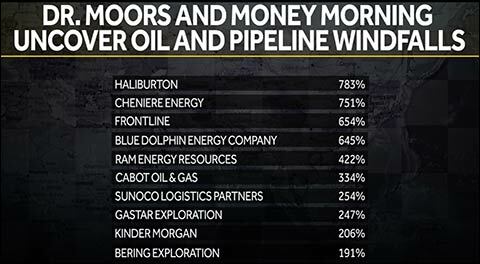 And what Ecuador handed them was a deal to control 90% of their oil. What's interesting about this – is you were the one China called on to play "facilitator." To keep the U.S. and China on friendly terms over this maneuver. China even chose you to explain this Ecuador deal to their people on their State Run TV network. Does that bother you – playing both sides in this Great Game? Mike, this is the world we live in. We don't want China as an enemy. That's why, like it or not, China has also moved their pieces over here. 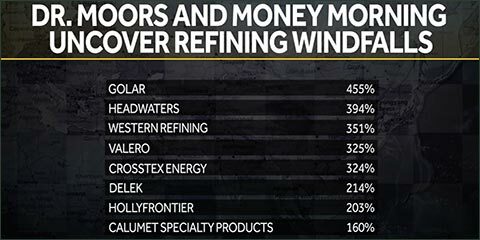 They have secured $44.2 billion worth of natural resource deals across the United States and Canada. So this is not a black and white issue – lots of greys here. I just help facilitate it. Your book does a remarkable job of mapping out China's strategic maneuvers – and what they mean to average Americans. And how much we have to worry about them from a military standpoint. But in the Great Game Action Plan, you've targeted three pieces China's moving around on the chessboard that could deliver powerful profit opportunities to average folks. For instance, you've set your sights on a $40 billion deal in Argentina. That will provide a major Chinese energy major I advise with direct access to oil reserves totaling 393 million barrels. The company on the receiving end of this $40 billion deal could multiply in value many times over. I'm thinking the floor here is 300% gains – the ceiling is unlimited. You've also targeted a shocking strategic alliance between Saudi Arabia and China involving an amazing technology. From your book – it's apparent – Saudi Arabia is going to be a very big loser of this Great Game. But this $109 billion Mecca Plan they are now carrying out with China, it could be an incredible opportunity for Americans. Yes, thanks to the United States – our energy boom – Saudi Arabia's queen piece on this chessboard (oil) has fallen. The Saudi's Mecca Plan involves running the entire country on renewable energy and low carbon fuels. The crown jewel of this "Mecca Plan" is to turn Islam's holiest city into the first major city to run completely on solar power. Saudi Arabia is playing kingmaker with a Chinese solar power company that has a groundbreaking technology that can make their Mecca Plan a reality. They've got $109 billion budgeted to start it. This Chinese company has already been on the ground in this country. 70 stations are being planned for phase one. But that's just phase one – it's about to be a $1 trillion industry. 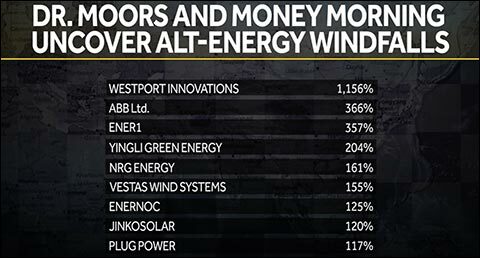 Given your history uncovering alternative energy windfalls, it's a safe bet to follow your lead there. This is a perfect example of how Chinese and U.S. interests can intersect for positive outcomes. Here our delicate relationship is mutually beneficial. The Trans Afghan Pipeline starts in a Turkmenistan gas field that could have more than $8.2 trillion worth of energy in it. To see China's play in this, you've got to follow the money. China has just clinched $100 billion worth of energy-driven strategic alliances in the Turkmenistan region. And the Asian Development Bank is leading the charge on this pipeline. Which is very fortunate for China, because three members of its Board of Directors and their VP of Operations have close ties to the Chinese Government. China is setting this up as a geopolitical move – to mark their flag in the ground in this region. To do so, they're playing kingmaker with an energy company – and here's the curveball – it's not in China. Here's another curveball – the United States – we're greasing the wheels here too. Because the Trans-Afghan Pipeline will wind into the Kandahar province of Afghanistan. 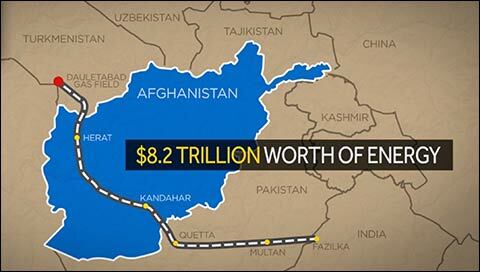 This pipeline secretly helps eliminate Afghanistan's dependency on Iranian oil. It's a crippling blow to Iran's economy. It also weakens Russia's strength in this region. And after what we've seen lately from them in the Ukraine – that's a good thing. This pipeline is a big geopolitical win for the United States. We're using China's moves on the chessboard to our advantage. It appears like it could be a big winner for investors too. Since you know about these situations before Wall Street, due to your line of work, you've done quite well with oil and pipeline opportunities. What's the potential with this one? It could provide over 13 times the revenue this company currently gets from its entire business. When the final deal has ink on paper – this company's share price could skyrocket – it could surge 10 fold and that's just the beginning. And your book, it reads like a suspense thriller. Like this pipeline situation you just talked about. You investigate military showdowns you've spent years on the front lines of. Now, in our last few moments I want to talk about a really important message you deliver in your book – it's one every American needs to hear. Despite what we just talked about – China isn't winning this Great Game. But – they won't come out as the biggest winner. We've been moving our pieces around on this chessboard too. With our defense contractor and the Zero Line Crisis. You also write about the U.S. plan to avert a historic catastrophe in the UK. Could leave England with the power of "a third world country." This situation is developing – and developing very fast – around the UK's North Sea. 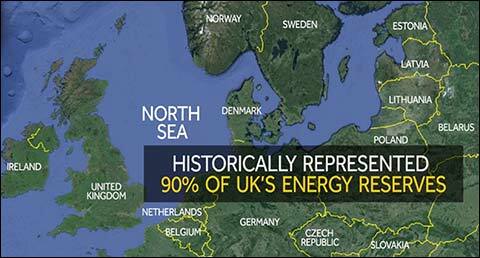 Since the early 70s, it has represented about 90% of the entire UK's energy reserves. Last Year the North Sea's Gas Reserves… Fell to a Two-Day Supply. Ships from Qatar each carrying six-hour supplies of liquid natural gas were put on emergency routes just to keep the lights on in London. That's over 4,000 miles away. We can't have a catastrophe of this magnitude strike the UK. It would take down our financial markets here because we are so interconnected. It would cause a currency collapse over there. 22 major smart grid projects are now being expedited for launch across the UK. And this is going to be a $400 billion a year global market. This company could easily reward investors quickly with 485% gains. We don't have time to map out all of the U.S. moves in this Great Game – the book explores them all, but there is one we have to discuss. Mike, it's a foregone conclusion America is going to achieve total energy independence. Everybody I work with at OPEC, in Russia, China already knows this. With the shale gas and unconventional oil coming out of Texas, Pennsylvania, North Dakota… we're soon going to be exporting our energy. We Control a Technology That Transforms 100 Barrels of the Cheapest Crude Oil on the Planet… Into 135 Barrels of the Most Highly Coveted Energy Ever. This technology can create "free oil." It's been developed inside a six-story building on a limited-access island in a neighborhood so small, you could fit 20 of them inside a single square mile. It even has its own off-grid power source. It's a fortress protecting this "free oil technology." It revolutionizes the way we refine energy through a process the EPA calls "regeneration." It expands the total volume of the oil by as much as 35%. This Refiner Achieves 135% Efficiency. And it doesn't just create "more" – it creates a form of green energy. Nobody would ever say the EPA has been quick to cheerlead oil. But they performed 10 separate tests that proved this technology will "reduce emissions." The Department of Energy… similar story. "Renewable gasoline and diesel fuel." "An economically attractive source of renewable fuels." And this isn't a future technology. The U.S. company behind it can already create enough free "green oil" to eliminate 1.57 million metric tons of CO2 emissions. So take the CO2 created in San Francisco, San Jose, and Sacramento, California each year… combined. Kent, you've been uncovering windfalls from refiners in rapid succession. But this one offers an unprecedented competitive advantage in the marketplace. Yes, and from a geopolitical standpoint – it magnifies our energy discoveries here – while lessening our need for – say, Middle Eastern oil. The Company With a Stranglehold on This "Free Oil" Technology is 1/20th the Size of Energy Titans Exxon, Shell, and BP. We could be in for a wild ride as they roll this technology out further. 650% gains – even higher – are possible. Dr. Kent Moors, we've only begun to investigate this $20 trillion a year global resource war. Which is why we're going to get free copies of your Great Game Blueprint into the hands of folks watching this today. There is another free piece to this package – an additional intelligence briefing we haven't discussed yet… The Next Great Game Battleground: The Arctic Showdown. I wanted to create a separate briefing for one of the most volatile and sensitive geopolitical events we face in the future. 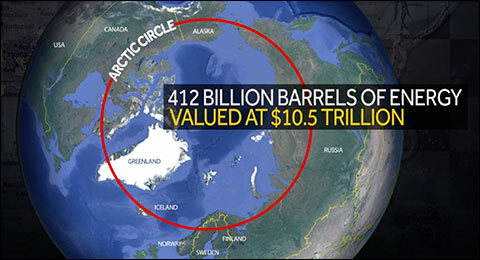 The arctic represents about 6% of the earth's surface, yet 20% of the undiscovered oil and natural gas on this planet. So just talking conservative estimates, we're looking at about 412 billion barrels of total energy, or $10.5 trillion worth. So the Arctic is a natural resource treasure trove. It is… but whose treasure is it? Who all believe they have a legitimate stake to it. This will eventually pit Russia versus the United States. All of the other nations will fold – they don't have the economic or military muscle. Will you soon be playing "facilitator" here? This is a sensitive situation, so yes. It's already being called the new Cold War. In the book, I reveal how this is going evolve – step by step. As well as the probability of the U.S. and Russia engaging in military hostilities over the Arctic. I talk about how it's connected to the big picture – the Great Game. And how we're going to win in the end. Then, in the intelligence briefing, you reveal the companies best positioned to be enriched from this arctic treasure. It's not just one company to focus on – there are two private-sector targets that our government, military, and intelligence agencies will attempt to play kingmaker with. These are longer-term opportunities, but they could pay off in spades for those who act on them now. It presents an entirely new perspective on the radical tactics our country and really each of us are going to have to take to deal with the future – with other nations, with our economy, and our financial markets. Plus, with these three investment intelligence briefings – you are helping people capitalize on the $20 trillion a year that's at stake, while showing them how to stay safe from the volatility along the way. It's been my pleasure Mike. My company, Money Morning, provides breaking economic and geopolitical news to over 550,000 daily readers and paid subscribers across more than 25 countries. Everything we've talked about today is going to reshape and rebalance global economies and international power structures. And we want to send it to you for free. It will help you navigate through these uncertain times. 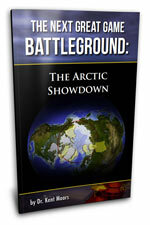 And finally, The Next Great Game Battleground: The Arctic Showdown. Simply click the button below to claim this free package. Or to become a member by phone call 800.672.0745 (or 443.353.4351 for international callers) and mention priority code WEADR320. But please do not delay, as we only have 1,000 Great Game Blueprints available today. For Dr. Kent Moors, I want to thank you for taking part in this exclusive, Money Morning event.